“It was a fantastic day. My daughter left so inspired and can’t wait to come back,” said Christina Provis. 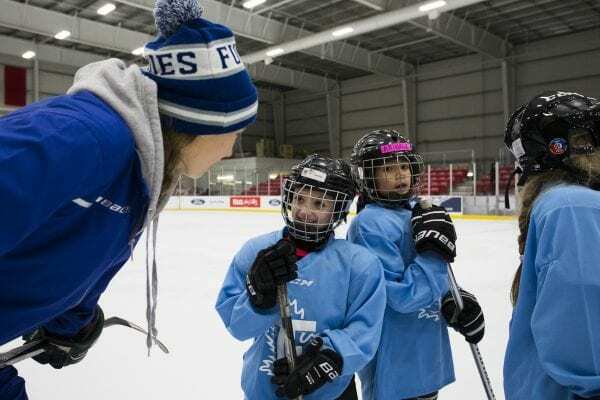 Rave reviews poured in through social media following the Toronto Furies and Grindstone Award Foundation skills clinic. 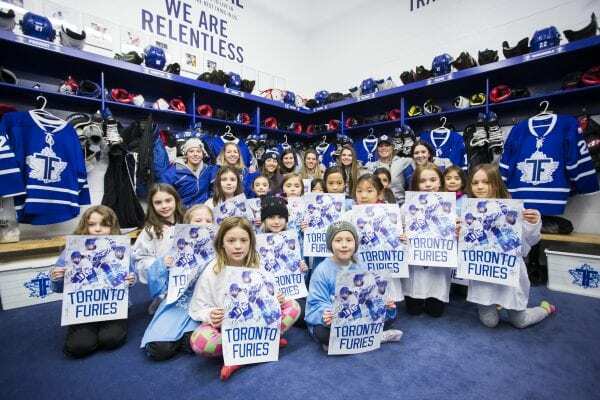 The Toronto Furies and Grindstone Award Foundation hosted 65 female hockey players for a skills clinic, meet and greet, locker room tour and Hot Stove session with Furies players Megan Quinn, Shannon Moulson, Shannon Stuart and Furies GM Sami Jo Small. 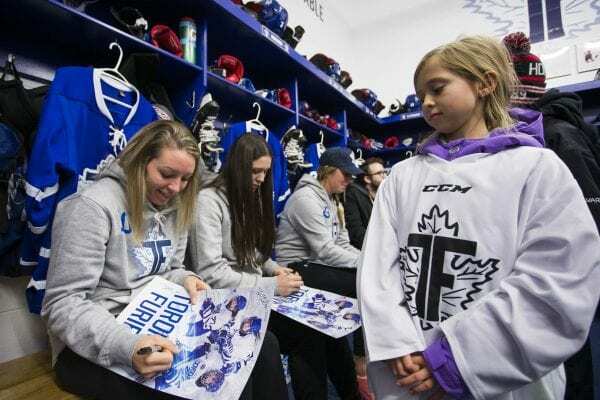 “As a parent a event like this gives kids like Sabrina the ability to see their favourite players face to face and and to have those players on the ice with her which was great.” said Jimmy Triantafillou, father of 6 year old Sabrina. “My favourite part was going in the dressing room and meeting all the players and meeting girls my age from around the city that I have never met or played with before.” said Sabrina after attending the November 17th event. Sabrina also told her dad that drills were fun, easy to understand because one of her worries ahead of time was she wouldn’t be able to understand the drills that they may be to advanced but it was perfect explained well easy to follow. This was also an opportunity for one of the thirty 2018 Grindstone Grant recipients to be honoured during a pre game ceremony. 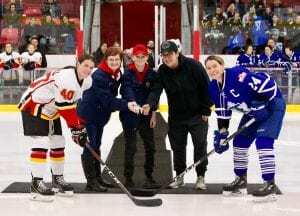 Faith Gilroy, recipient of a Grindstone Grant, made her way from Barrie to be at the Furies game that evening to drop the puck. This was the second Grindstone charity clinic in conjunction with the CWHL this season. 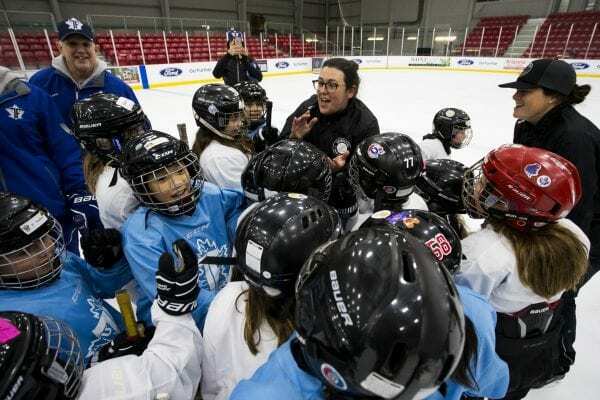 Earlier this month the Calgary Inferno hosted a group of female players in a similar event over 2 days. Don’t miss your chance to be a part of the Markam Thunder skills clinic on Dec. 9. Youth (ages six to 16) can skate with the Thunder players, enjoy a meet and greet and a Q&A session at Thornhill and Angus Glen Community Centres at our next event which takes place from 11:30 a.m. to 7 p.m. Registration is $85 (plus tax) and includes tickets to the Thunder and Inferno game. For more information click here.